A music festival planned to mark the 775th anniversary of Ennis has been cancelled after residents voiced concerns over anti-social behaviour. The organisers of INISFest, Impressario Events, met with residents on three occasions in the last few weeks, most recently on Friday. After negotiations failed, the decision was made to scrap the event. Following a meeting on 30 March, organisers agreed to look into issues such as security, parking, and increased Garda presence to prevent loitering and anti-social behaviour. We want to be sure that all the people that have no accommodation, that have nowhere to go, that are sleeping in their cars, puking over our walls and peeing in our gardens are going to be monitored. 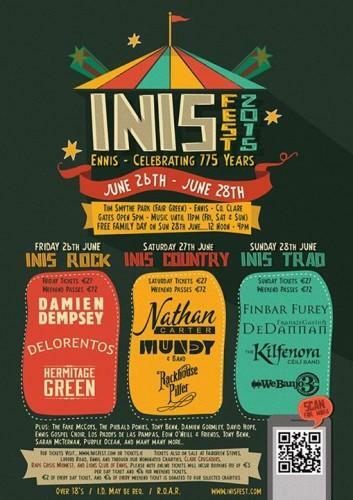 A spokesperson for Impresario Events said the organisation is “disappointed that such a positive event for the town of Ennis is not going ahead at this time”. However, they said they “look forward to working with all interests to stage such an event in the future”. “Impresario Events would like to thank An Garda Síochána, Clare County Council, the Vintners Federation of Ireland, HSE, St Joseph’s Hospital, Clare County Fire and Rescue, Clare Civil Defence and the wider community for their support for this event,” the spokesperson added. Organisers claimed the festival was worth more than €1.5 million to the local economy. All ticket holders will be refunded. The festival was due to be held in Tim Smythe Park from 26-28 June. Delorentos, Damien Dempsey, Finbar Furey, Nathan Carter and Mundy were among those lined up to perform. Speaking at its launch back in February, Mayor of Ennis, Fine Gael councillor Johnny Flynn, said the festival would “deliver huge benefits for the local economy and the tourist sector”. “I have heard that some Clare people abroad are planning to return home for the weekend which underlines the sense of community that this event will also bring,” he added. Flynn did not respond to a request for comment yesterday.